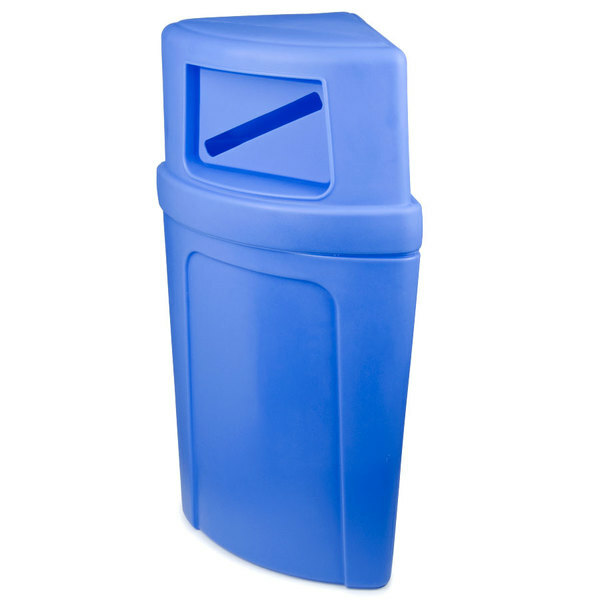 Make recycling easier than ever with the Continental 8325-1 Corner'Round 21 gallon blue recycling container! To ensure proper use, it features a slot along its domed lid for paper recycling, and comes complete with trilingual (English, Spanish, French) "Recycle Material ID Labels." Its versatile design conveniently fits into corners to save space, or can be used alongside the other three Corner'Round recycling containers and Recycle'Round dolly to create a customized recycling collection program. It's perfect for open settings like school cafeterias, atriums, foyers, food courts, airport terminals, plazas, convention centers, and much more! The Continental 8325-1 Corner'Round paper recycling container offers a clean and professional appearance with a unique key-way feature that allows a poly liner to be secured while helping to hide the unsightly bag "skirt."